AA Laxulon is a supplement for cats and dogs to encourage bowel function and prevent constipation. AA Laxulon is a supplement for cats and dogs to stimulate bowel function. Lactulose belongs to the group of so-called osmotic action laxatives (medication to prevent constipation). In the colon, lactulose is converted into specific substances that stimulate and regulate natural bowel function, resulting in the formation of a natural stool. It may take several days before the desired action occurs. 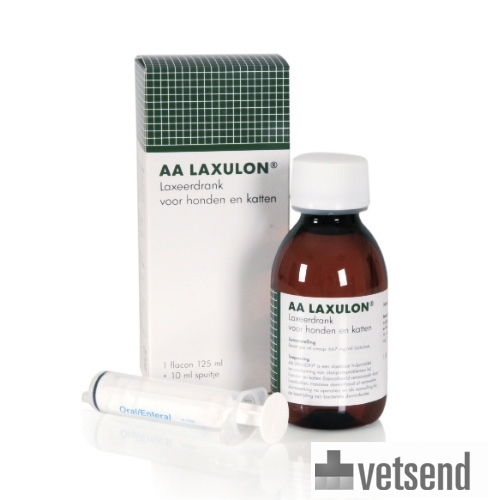 AA Laxulon is a liquid formula designed to stimulate bowel function in dogs and cats. Contents (per ml of syrup): 667 mg / ml lactulose. Laxulon is safe to use in accordance with the recommended dosage and can be mixed with food or drinking water, or administered directly into the mouth. 3 ml per 5 kg of body weight once daily. 3 ml per 5 kg of body weight, 3 times daily. Always consult your veterinarian if the symptoms worsen or do not improve. Push the syringe firmly into the bottle opening. Have you used AA Laxulon before? Let us know what you think about this product. Great product it does what is says ive got one happy cat back to her normal self fantastic price what more could you ask for . I am only writing this review because it is an excellent product. I have been giving it to an older terrier and it has improved almost every function. she seems much younger and happier since I started giving her tthis stuff. Worth trying certainly.